Following a recent bulk purchase, Furnimax furniture Megastore have acquired a huge selection of Natuzzi Editions and Natuzzi Italia clearance stock at hugely discounted prices. Starting with the Natuzzi Italia range of models to clear we have a Natuzzi Zelig reclining three seater plus reclining armchair. This sofa suite normally retails in the Natuzzi gallery at 4999 If you mention this blog we are going to let it go for an un-advertised price of 2249. For a great choice of chaise corner with inbuilt reclining mechanism adjustable headrests we have the Natuzzi Malcom along with a matching recliner chair finished in the signature white soft Nappa leather. The chase section also features ottoman storage. The Natuzzi Volo is an amazing new design featuring electric rising headrest and recliner motion that has dual function buttons to control each element independently. 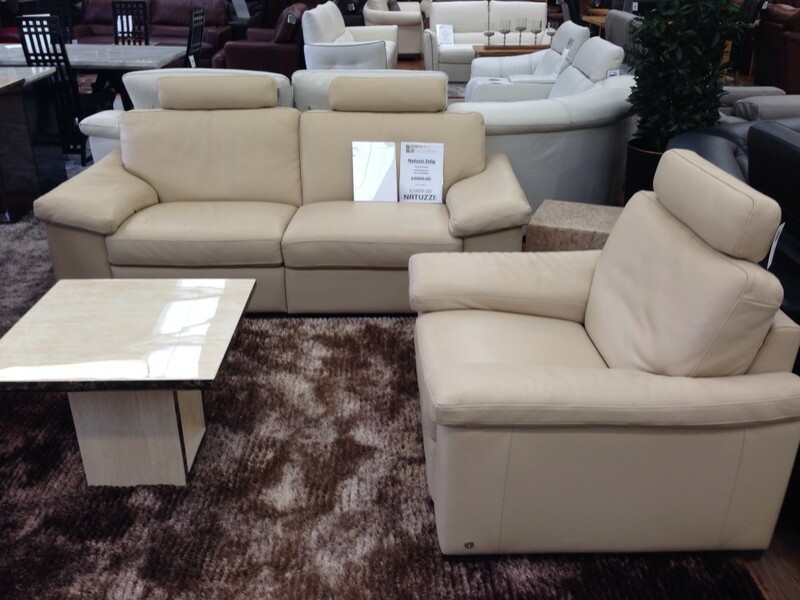 This model captures the true spirit of Natuzzi and is usually in the Natuzzi gallery at 4999. If you mention the newsfeed of our website, this blog we will let you have the last one at heavily discounted price of 2999 A fantastic web special offer. For those who appreciate the Natuzzi brand who’s budget won’t stretch to the prices of the Italia range, we have a range of ex show models. Here’s just one example: Graphite grey three seater sofa + two seater sofa complete set in tungsten category 10 genuine Italian thick high grain leather usually retailing for 2999 final reduction price of 1299. We believe that this has to be one of the lowest price deals on Natuzzi Editions.Please note these offers are for individual suites while stock lasts. and cannot be repeated to order as they are way below the actual cost price of the sofas themselves, and sold in our capacity as a factory outlet selling out shop for sofas. Another example is the Natuzzi Editions Sonno, a show model at Natuzzi UK , this category 15 soft Terra leather in espresso brown combines a large three seat square arm contemporary sofa with a two seat sofa and large pouffe. The sofa set also features contrast piping in mushroom and also converts into the ultimate in sofa beds with a metal frame folding out to the size of super king with an Italian memory foam mattress making it a usable and very comfortable sofa bed. The usual gallery selling price for this model in this quality of genuine Italian leather is 4999 once again it is offered in our factory Outlet sale at just 2499. For a fantastic beige Sand choice the editions Copenhagen three-piece sofa Suite combines an electric reclining three seater with adjustable pull up headrests and thick saddle stitch with two super comfortable armchairs. Epitomising the concept of cool urban living and combining family comfort with the durability and beauty of leather. Again, a huge 2000 pounds discount at just 2999. 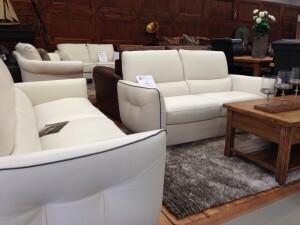 We could not fail to mention the of the star of the show sofa sets. 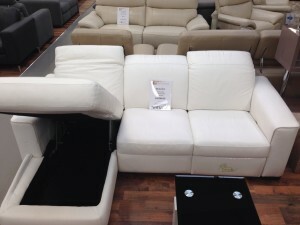 Please read our Largo review on the newsfeed for more details of this one briefly it is a cool ‘contemporary yet retro’ three seater with discrete power recliner and static two seater as displayed and can be ordered in your choice of leather. The one in our showroom is in a category 30 top of the range natural and fully aniline leather which is designed to quickly acquire a rustic ‘lived-in’ patina to give a vintage look and feel. Think original Levis 501! The beauty of the suite and leather is unprecedented and it is died using a time proven age-old craftsman process in a deep red natural colour and is one of the most stunning sofas in the world. As the UK’s official factory outlet store we also have exclusive an unprecedented availability on concept research and development models that do not make it into production. We are the only outlet where you can find a Natuzzi designer brand sofa which is absolutely unique! One example of this and offered for sale in our showroom is the Editions Athena a 7213 seater and two seater gives a vintage townhouse feel and combines soft comfort. 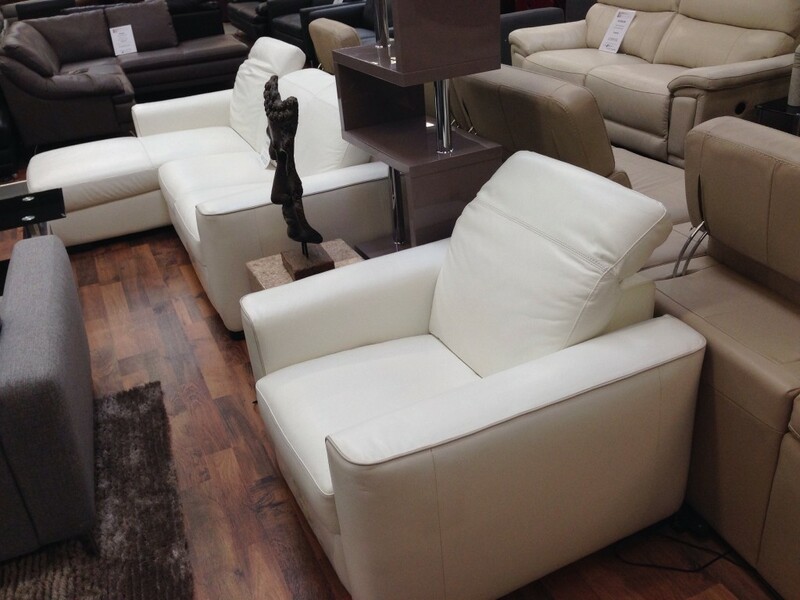 A special offer we have in our store here in Lancashire is finished in ivory white leather with coffee cream contrast piping and beautiful dark oak feet and Lower surround. If you mention our newsfeed a fantastic web special offer extra and giving you the lowest possible price for an editions suite of this calibre we will give you a genuine leather Editions Pouffe. Viewing is most welcome in heated showroom, open 7 days a week. We will be happy to offer you a freshly ground coffee or soft drink after your journey. We also have our own car park and disabled toilets and access facilities.